She's Fantastic: Teenage Mutant Ninja Turtles - APRIL O'NEIL! Teenage Mutant Ninja Turtles - APRIL O'NEIL! More than any other reporter in comics and cartoons, I think April O'Neil embodied an iconic look that none of her predecessors were able to achieve. Lois Lane and Betty Brandt pretty much have to be introduced each time they appear because the rarely look the same twice. But April O'Neil, throughout all her iterations, is always recognizable. 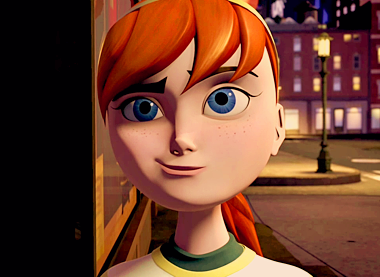 The newest Teenage Mutant Ninja Turtles animated series from Nickelodeon has the most drastically different April so far, but she's still very recognizable with auburn hair and a yellow outfit (it doesn't hurt that she's the only girl in a handful of green mutant turtles either). This version of April isn't actually a reporter at all, but rather a high school student whose parents have been kidnapped by the Krang (now a whole race of brain aliens). April still fulfills her role as the Turtles' link to the outside world and it's a fun modernization of their classic dynamic. The CGI look of the new series is an interesting departure from the classic looks as well, but it's a change that seems to be working as the toy aisles are filled with TMNT lately. Let's check out April below! April comes with a variety of Martial Arts weapons. The only ones she can really hold well are the sword and bo. Here are some images of April from the cartoon. I like this April and this modern take on the turtles too. Yeah the whole property is really fun and interesting. I'm eagerly waiting for the Newtralizer figure to hit the shelves. I love how they're still creating new characters that fit in with the vintage feel. I hope the new movie doesn't change everything in a bad way. This was the only figure from the Nicktoon series that I had to buy online. I have never seen her on store shelves. Playmates did mention they are making a Karai. I was thinking we would see her at Toy Fair, but I guess they are saving her for SDCC. My only nitpick with the Nicktoon figure is the mouth area. You can barely see that she has a mouth! I'm sure I could easily draw a mouth line on with a pen or something. I'd almost be inclined to cll her a shelfwarmer here. I see her often at Target, Walmart, and TRU (I'm always checking for Newtralizer). 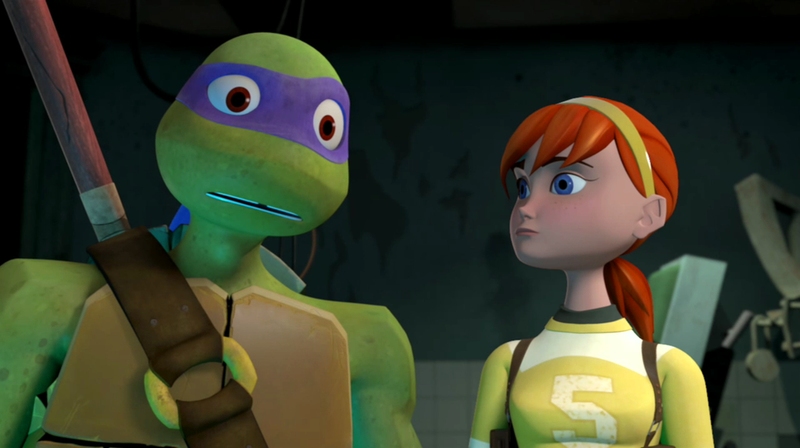 I didn't hear about Karai. That should be interesting - i like her look in the new show. For some reason I can never see pics posted on the fwoosh. I get a spinning "loading" icon and nothing else. I'm kind of dreading what a megan fox april figure would look like anyway. like a turte fans, i add to my collection without doubt, but the lack of articulation and the poor paint aplication make me think all the wasted potential,come on playmates! I agree. I realize they are limited if they are going to keep their figures under $10, but I think a lot of fans would pay more for a higher quality figure.